Free Nights Offer – Stay for 6 nights and get 1 night free or stay for 12 nights and get 2 free nights. Please contact us for further details. Set on a paradise island is Velassaru, Maldives. Surrounded by the natural elements, guests are swathed by the shiny lagoon, sparkling white sands and the warmth of the sun’s rays. The expanse of the Indian Ocean is phenomenal and the Velassaru is a chic and stylish hotel. Intimate bungalows and villas are luxurious in style yet comfortable in setting. Natural light floods each living space and wooden beams compliment the thatched roofs. Lost in the oasis of your bungalow, topical colours accentuate delicate touches and you will capture magical memories that will last forever. Sleek, simple finishes make each villa and bungalow an effortlessly, fascinating stay. Rejuvenating at the alluring overwater spa is as heavenly as relaxing by the infinity pool, with views of the ocean and beach unfolding before you. Feast at one of the unique restaurants or go snorkelling in the exotic lagoon. Whatever your activity of choice, be hypnotised by the stunning beauty of Velassaru, Maldives. Free Nights Offer – Stay for 6 nights and get 1 night free or stay for 12 nights and get 2 free nights. Honeymoon Offer – Stay for honeymoon and receive honeymoon treats. A romantic private escape. If you want a luxury picnic hamper or dinner on your secluded beach, Velassaru make it possible. Fitness Centre – the fully equipped fitness centre is an exhilarating get away. As the sun rises, take time out to keep fit, before lazing by the pool. Set on over water pavilions, traditional therapies have been mastered to rejuvenate and relax. Calming sounds revive each guest, as bespoke treatments are orchestrated in any of the ten treatment rooms. The hydropool sits delicately over the lagoon, a perfect place to help pass time and offers encapsulating views, to be enjoyed with a loved one. The relaxation room is a sanctum designed to help recharge. Also located in the spa, is the manicure and pedicure room. 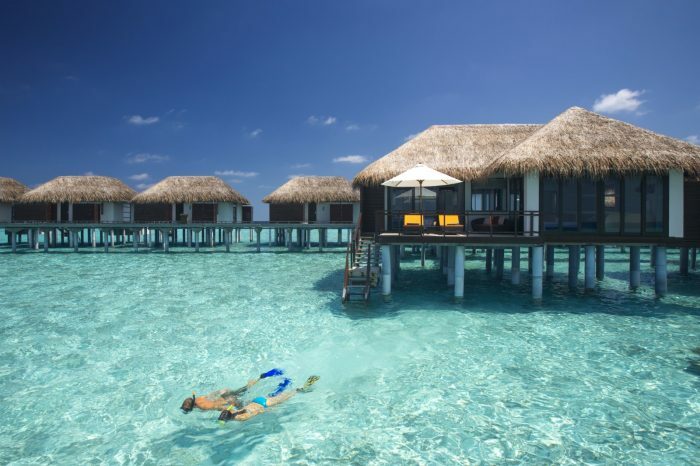 Velassaru, Maldives is a spell binding romantic retreat for all honeymooners. The intense simplicity of Velassaru, surrounded by crystal clear waters and cerulean blue of the sky and fluffy white clouds makes this an ostentatious resort. As honeymooner’s relinquish before such astounding beauty, special moments are created. Styled to minimalistic and luxurious perfection, much sophistication is afforded at the Velassaru. Airy, spacious, natural villas gleam brilliance and guests are lost in a paradise, solely designed for their comfort. The finest materials and textures blend together to emphasise Velassaru’s elegance. Guests can choose if they want an over water hideaway or a beach villa with its own private plunge pool. Delicious, fresh seafood is served in eye opening settings, with unending views. As the sun sets, wonderfully ambient evenings take centre stage and guests recline in the comfort of Velassaru. The stilted over water Spa is a hit at Velassaru, couples treatments are further intensified by the worldly techniques that revitalise every stressed muscle. For a more intimate experience, spa treatments can be enjoyed in the comfort of your own villa, followed by a private dining experience. Fen Bar – A beachfront restaurant serving tantalising Asian and European twists. Casually dine as you rest on a day bed or bean bag, to the sounds of crashing waves. Turquoise – Serving an array of international menus, the fresh juices and fresh fruit is refreshingly divine. Etesian – Modern surroundings are the perfect backdrop for wholesome Mediterranean dishes. Sand – Private dining experiences can be enjoyed at this impeccable restaurant. The hot stone grill and signature menus are sumptuous. Vela – A fanciful international menu is served. Watch the masterchef’s at work at the entertaining live cooking stations. Tenderised meats and freshly caught seafood is served. Chill Bar – set overwater, fill flavoured Spanish tapas is served with mouth watering refreshing cocktails. Teppanyaki – Sushi and sushimi is served that is authentic in flavour. Picturesque views are to be enjoyed with the seared salmon.